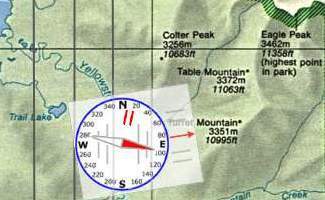 Now that you understand that a map has north-south lines on it representing longitudes and your mountaineering compass points to magnetic north, you can take readings from a map and navigate across country following a course of your choosing. Being able to do this is the simplest use of a map and compass together so let's tackle it. To read a heading from your map, you just need to know where you are on the map and where you want to go. Let's say you are camping on the east shore of Trail Lake. You've woken up, had a great breakfast of maple and brown sugar oatmeal (with raisins), and packed camp. Today, you want to hike to the top of Table Mountain. Unfortunately, you can't see the mountain from camp because the ridge running south from Colter Peak is blocking the view. 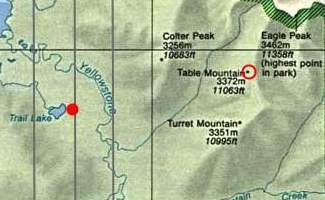 You need to figure out what heading to take to reach Table Mountain and what course to follow using your compass. For right now, just ignore the needle on your compass. It will be important in a minute, but right now you just want to use the baseplate, dial, and orienting lines of your compass. Lay your map on the ground - it can be facing any old direction. Find your current location on the map and where you want to go. Lay your compass on the map so one edge makes a perfect line from where you are to where you want to be. If the distance is too far, use a straight-edge of some kind to line up the two points - a piece of paper, edge of another map, tent pole, anything that is straight. Then, place your compass edge up against this line. Now, you have taken the bearing. The direction at the index pointer is the direction in which you must head to reach your destination. In this case, it is about 85 degrees. Pick up your map and put it away. Now you need to pay attention to your compass needle! Hold your compass flat in your hand and turn your body and compass until RED is in the Shed. Of course, you are now facing the direction in which you need to travel. 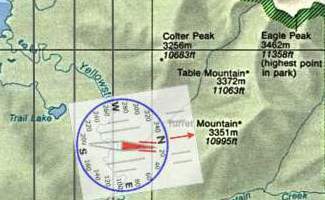 Figuring your heading from a map is the most basic way to use a map and compass together to plot a course of travel. It is often all you need to do, but sometimes you are able to better figure out a situation by having the map laid out on the ground so it lines up with the real world around you. Hidden marks in diamonds anger many people. The names of three countries are hidden in the sentence above. What are they? See the next page for the answer, of course. In this example, if you have an east declination of 10deg, do you adjust for this by mentally subtracting 10 from your bearing of 85deg? So assume your bearing should be 75deg? Or after taking a heading of 85deg from the map (with no adjustment for declination) do you then set your compass to adjust for declination (-10deg) so the "shed" is at 1 o'clock before turning your body to face 85deg and heading off? What I'm getting at is that in your diagram it seems that you are able to adjust your "shed" for declination without moving your "orienting lines". I have a similar looking Silva compass, but the orienting lines rotate with the shed. @mantle - You set your heading AFTER you have accounted for local magnetic declination. 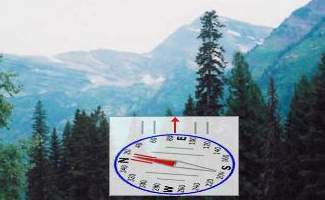 Read about magnetic declination. If your compass does not allow declination to be set, then you do need to just do math in your head. When triangulating your position without orientating your map we subtract the magnetic declination from the bearing we took, do we need to add 180 when the true bearing is less than 180 and vice versa?? @Germaine - Your question doesn't make sense to me. You don't triangulate without orienting your map first. Have you read the page about Triangulation?